How does one measure the value of a college degree? The 2014 Gallup-Purdue Index does it by measuring the long-term success of college graduates along three axes—and shows that UVA alumni come out ahead of their peers on each. 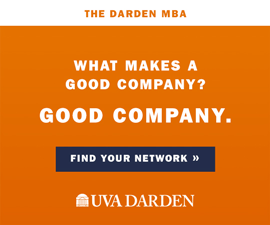 The survey, commissioned by UVA’s Office of the Provost, measured workplace engagement, well-being and alumni attachment using a sample of more than 8,000 UVA. alumni who received undergraduate degrees between 1950 and 2014. 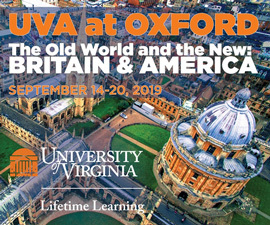 The survey, taken in October 2014, found that 85 percent of UVA alumni are in the workforce, 89 percent are flourishing in one or more of Gallup’s five elements of well-being, and 41 percent strongly agree that UVA prepared them well for life after college. The graduates’ percentages are higher across the board than national averages, as well as for alumni from other institutions in the Association of American Universities, considered to be peers. The survey drills down from broad employment numbers to look at how engaged employees are in their jobs, a metric the Gallup scientists consider critical. “Engaged workers are the lifeblood of organizations,” they write. “They are more loyal, more productive and more profitable than those who are not engaged.” Forty-eight percent of full-time employed UVA alumni are engaged in their jobs, compared with the national average of 39 percent of college graduates. 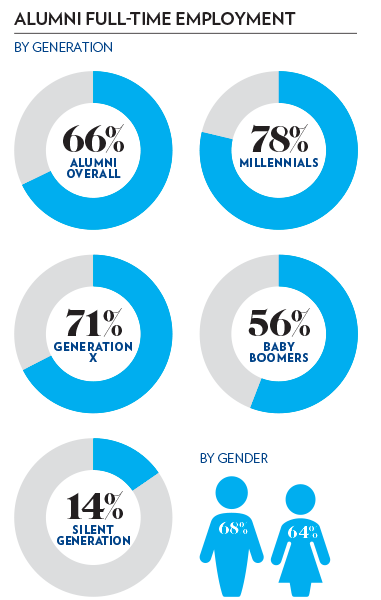 Only 6 percent of UVA alumni report being actively disengaged from their jobs, half the national average. You can download the full survey here.